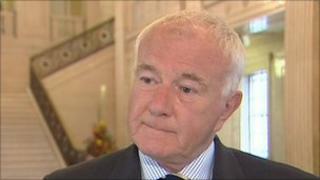 The Ulster Unionist Party has expelled Strangford assembly member David McNarry. The party said a disciplinary committee to investigate and deal with complaints against Mr McNarry met on Monday. In a statement the UUP said: "We followed due process and arrived democratically at our decision" (to expel him from the party). At the end of March, Mr McNarry was suspended from the Ulster Unionists for nine months. He said on Tuesday the news that he had been expelled came as a "surprise to him" as he had been invited to attend a disciplinary hearing on Wednesday. The Strangford MLA said he would make a more detailed statement in about a week's time. Mr McNarry resigned as the UUP Stormont whip in January after party leader Tom Elliot demoted him from the deputy chair of the education committee. He also resigned from the party's assembly group, but remains a party member. Mr McNarry's fall-out with Mr Elliot came after Mr McNarry gave an interview to the Belfast Telegraph detailing discussions between the UUP and DUP about unionist unity. After Mike Nesbitt replaced Mr Elliot as party leader in March he said: "I cannot imagine any circumstances under which David McNarry would be back in the Ulster Unionist assembly group of MLAs when I have control of the whip." He said he would make a more detailed statement in about a week's time.